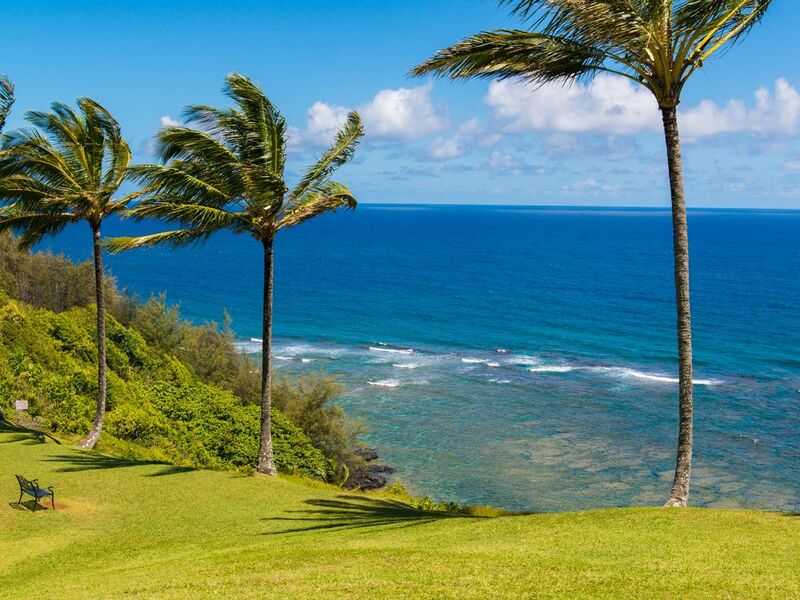 We are located in Princeville, Kauai on a beautifully manicured grass knoll with views of the ocean from the lanai, living room and bedroom. Just steps away is a trail that leads to your own secluded cove. This is the perfect place to relax in the sun and snorkel along an awesome coral reef teeming with many colorful tropical fish native to the islands. Are you a golfer? The Prince and the Makai are two exciting golf courses that surround our location. Return to the condo and prepare your meals in our well equipped kitchen or if you choose, dine out at one of the many restaurants in the area. At night fall asleep to the soothing sounds of the waves breaking on the shore. Also we have Netflix as an added feature. In the winter season, late December thru March, watch the whales migrate right in front of our place. Paradise is closer than you think. Come visit Kauai soon. Hi, We are the Grindle's. Jim, not pictured, Ricki and our daughter Jaimi are the owners of our Princeville condo. While Jaimi was studying to become a Nurse she lived in the condo we now own. As parents we could not believe she lived in such a wonderful area as Princeville right on the ocean. One day she called and told us that the owners of the condo asked her if she would like to buy it. We were so excited about the idea that we said, lets do it. How could you not want a place right on the ocean in Kauai. Over the next six months we put in $40.000 in up grades. A friend of mine said if you are interested in renting your place I recommend vrbo. It was the right thing to do. Now we can rent our place and go when we want to. It has worked out perfect. Ricki and I live in Dana Point, Ca. and visit as often as we can. Kauai is known as the' Garden Island' and Princeville, located on the north shore, is unreal. We are right on the ocean with wonderful trade winds. At night we fall asleep listening to the waves breaking on the shore. Its paradise.